La Pulcina Piccola, international chicken of adventure, the bravest, boldest, most daring chicken that ever lived, follows her heart to the ends of the earth — and beyond — in her eternal quest for love. 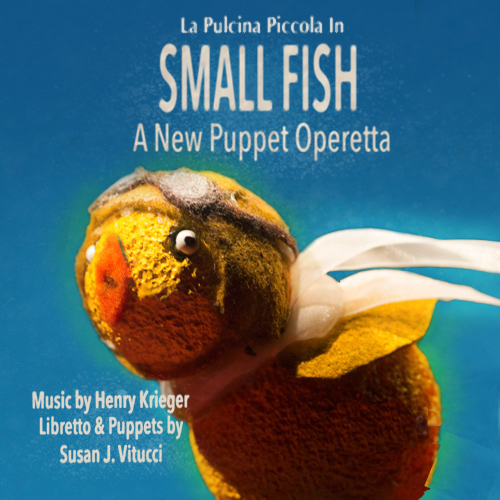 A Multi-Media Puppet Operetta in Italian with English surtitles. A larger-than-life bird, La Pulcina Piccola’s story begins with the familiar "sky-is-falling incident," when an acorn falls on her head and she leads her barnyard friends to tell the king of impending disaster. When the friends part ways, La Pulcina goes on to fame, fortune, and extraordinary adventure. Her eventful life includes forays into politics and the theatre (where she triumphs as Richard III), and--always, always--romance. A grandly life-embracing and life-affirming character, La Pulcina Piccola's approach to life is simple: enjoy today, for the sky may fall tomorrow.